Well, it’s been a little over a year now since we purchased the farm, and it’s amazing to look back at photographs and Google Earth and realize just how much has changed. Like so many other areas in life, we tend to focus on what we have left to do and thereby lose sight of what we have accomplished. Then we think back to last winter break: the torrential rain, the leaky RV and getting stuck in the mud! Now we have a driveway, the RV no longer leaks, we have indoor plumbing, and we are able to live on the land. Now that we are heading back into winter, we have to protect the progress we’ve made. One of our first projects is protecting the well. 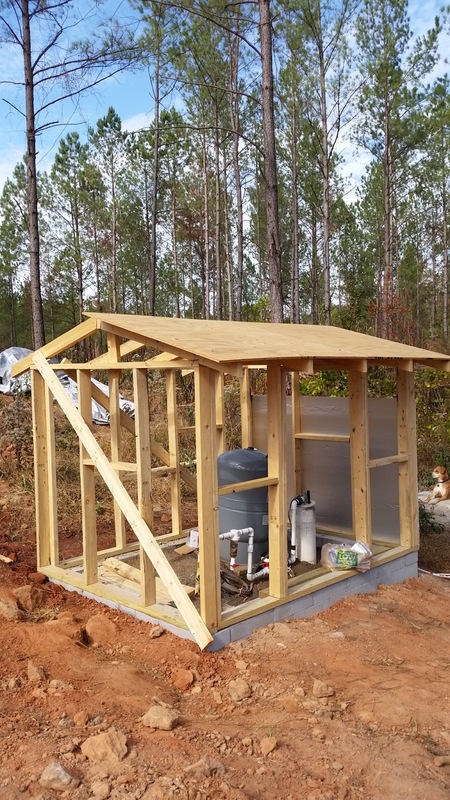 Hubby and BIL framed the well-house in October, and we were able to get it dried in a couple of weekends ago. We made it a little bigger than necessary so that we’d actually have room to work in there as the need arises! BIL had to have the pump replaced on his well, so we were able to take his experience and plan for the possibility of needing to cut a hole in the roof! Eventually we’ll place a cupola on the roof to allow for ventilation and for access to the pump from above, but that probably won’t happen until next summer. 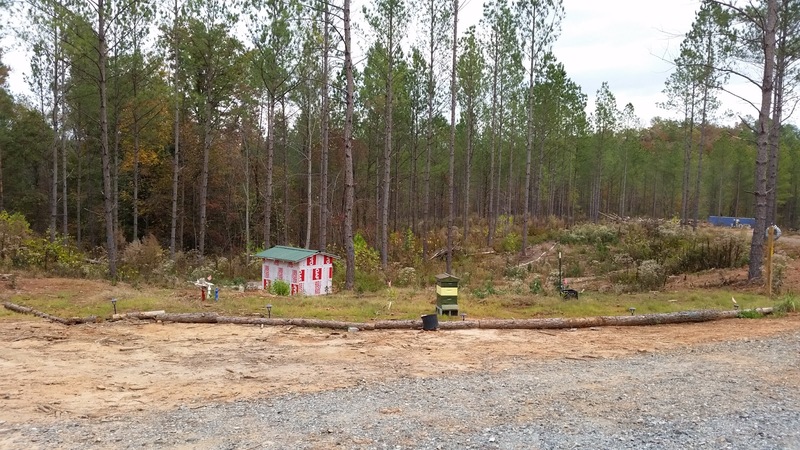 The cupola will be the finishing touch on what will be my little red schoolhouse. Hubby was originally going to build a full sized shed in the style of a school house, but now that we’ve gone with the less costly and more secure shipping container, I get to downsize my decorating. We already have the siding and the red paint, so maybe that step will be done by the end of Thanksgiving break. After that, I’ll buy some of the curlicue decorative stuff from Lowes and jazz it up a little. We’d seen Ondura roofing on HGTV some time ago, and had considered it for the house. We decided to try it on the well-house first. It was easy to install and we love the vibrant color. However, we bumped into the end of one sheet with the ladder and damaged it. It withstands pressure from above well, but we worry about how much would end up damaged during installation of a full roof. The ridge cap is also a little wavy. The sheets cut well with a circular saw. Ondura is supposed to be resistant to hail damage, and I believe it will be because of its flexibility. It’s a good product and attractive, but we think we’ll go with a metal roof when we build the house.